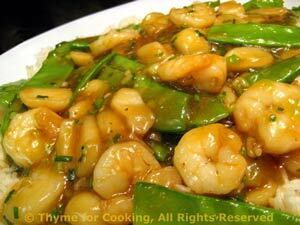 Stir-Fried Shrimp with Snow Peas (Mangetout), an easy spring main course. Heat oils in large nonstick skillet over medium-high heat. Add onions to skillet and stir-fry for 30 seconds. Arrange Basmati on a large platter. Spoon Shrimp and Snow Peas on top and serve. Heat butter and oil in a small saucepan over medium heat. Add rice and sauté, stirring for 1 - 2 minutes. Add stock or water. Cover and cook rice for length of time on package.